If you’re wondering where your next holiday destination should be, wonder no more: We think the capital of Queensland should do the trick. Brisbane is a booming metropolitan area with a vibrant nightlife, an up-and-coming arts scene and heaps of other fantastic stuff to check out. If you’re wondering where to stay while exploring this dynamic city, we have that covered, too. There’s an inner suburb where museums and IMAX theatres sit side by side. 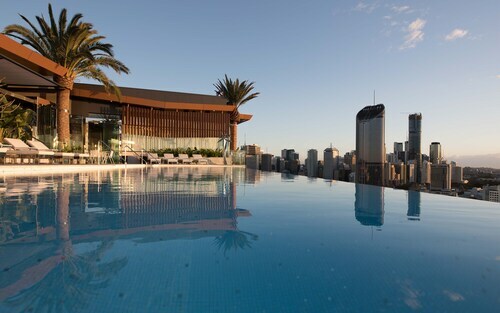 Take a peek at Wotif’s wonderful selection of South Brisbane hotels and plan your holiday today. How do I get from the airport to South Brisbane? Your adventure in Queensland will begin at Brisbane Airport(BNE), 17km from the central business district. There’s a number of transportation options to choose from like riding the rails on the Brisbane Airtrain, taking a taxi or getting yourself car hire from Wotif. Once you get to your accommodation in South Brisbane, you can rent bikes to explore the town or hop on a ferry and check out other riverfront suburbs. 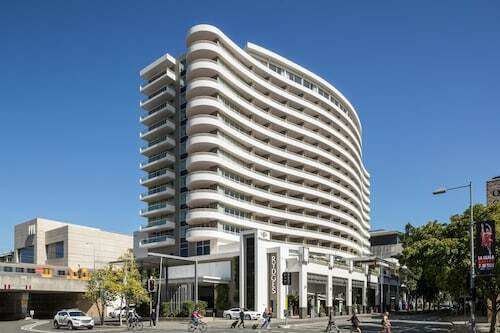 What are the most popular hotels in South Brisbane? What kind of hotels are there in South Brisbane? 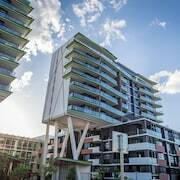 The Sebel South Brisbane is a fantastic joint that offers its guests luxurious self-contained apartments. You’ll have access to a fitness centre, a dry cleaning service and Wi-Fi. When you book a stay at the Rydges South Bank Brisbane, you’ll be lodging in one of the most luxurious joints in town. Whether you’re coming for business or leisure, this place is perfect when you want to enjoy the finer things in life. Where should I stay in South Brisbane? 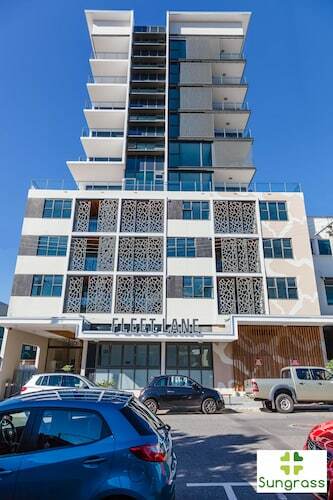 If you stay at Fleet Lane, you’ll be within walking distance of the Queensland Museum & Science Centre and the State Library of Queensland. The Sapphire Resort is near the Go Between Bridge, a toll bridge for pedestrians, vehicles and cyclists. Go for a stroll across the river and shop in the Milton Markets. When you wake up at the Riverside Hotel South Bank, grab yourself a cup of coffee and breakfast before making the quick walk to the Queensland Gallery of Modern Art. What are some things to do in South Brisbane? The South Bank Parklands: One of the biggest tourist attractions in the city is this fun zone, located on the former site of the World Expo 88. Go for a walk through The Arbour, which houses 443 curling steel columns. If the sun is warming you up just a little too much, take a dip at Streets Beach. This manmade aquatic area is great for cooling off during your adventures in this happening little neighbourhood. If you want to get a bird’s-eye view of the state’s capital city, go for a spin on the Wheel of Brisbane. You’ll get more than a few epic selfies from 60 metres above town. Big cities are fun and glamourous, but they also hold amazing secrets—like this neighbourhood. Book one of Wotif’s South Brisbane packages and see what other jewels this place hides. But when the call of the wild draws you north, book Cairns accommodation and make the 2-hour flight to the northern tip of the state. Haven’t you ever wanted to see the Great Barrier Reef? How Much is a Hotel Room in South Brisbane? 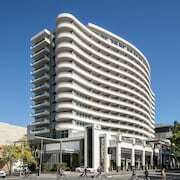 Hotels in South Brisbane start at AU$118 per night. Prices and availability subject to change. Additional terms may apply. The pool area is incredible, the service outstanding, the rooms divine - who would have thought to put a tv in the mirror! :))... and there’s even a wine fridge! This hotel has thought of all the small details, and exceeded all of my expectations. I’ll be back! Location was good being handy tio Southbank given the wet weather. The Restaurant was disappointing. It was too expensive for what it was & the Irish coffee was served lukewarm. I would reconnend guests eat out rather than in the hotel. .
Used the apartment as a base to explore the museums, see a stage performance at QPAC and explore Southbank parklands. Can’t be beat for location and value for money.